If you have purchased a firearm you may have seen the signs: “Don’t lie for the other guy” warning those purchasing firearms for someone else buying a firearm for someone that is not allowed to own one (Eg., Convicted Felons) you can end up in jail. However, the supreme court attenuated the law a little in the case of Abramski v. United States. What seems odd from this opinion is that The majority holds that even if both the “straw” purchaser and the intended recipient are eligible to purchase and possess a firearm, it still can be an illegal straw transaction. In my opinion this decision ignores the purpose of the legislation – to prevent criminals from acquiring guns. However, the court disagreed, seeming to say that the real purpose was to be able to account for who are the actual purchasers and holders of specific firearms. In a 5-4 opinion, the court held that the law applied to a Virginia man who bought a gun with the intention of transferring it to his uncle in Pennsylvania — even though the uncle is not prohibited from owning firearms. The debate centers around federal gun laws intended to prevent sham buyers from obtaining guns for the sole purpose of giving them to someone else. 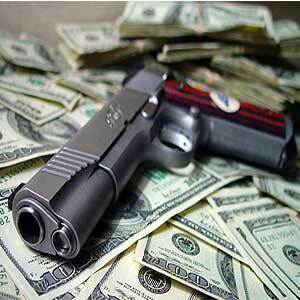 The laws were part of Congress’ effort to make sure firearms did not get into the hands of unlawful recipients. Defendant Abramski bought a Glock 19 handgun in Virginia in 2009 and later transferred it to his uncle in Pennsylvania. Abramski, a former police officer, assured the Virginia dealer he was the “actual buyer” of the weapon even though he had already offered to buy the gun for his uncle using his expired police identification to get a discount. Abramski purchased the gun three days after his uncle had written him a check for $400 with “Glock 19 handgun” written in the memo line. In dissent, Justice Scalia said the language of the law does not support making it a crime for one lawful gun owner to buy a gun for another. Expectedly, Scalia was joined by the court’s other conservatives — Chief Justice Roberts and Justices Clarence Thomas and Samuel Alito. Abramski is being too honest where he doesn’t need to be, and too dishonest where it is most important to be honest! How could this problem have been avoided? He should have said he was buying the gun for another person that could have lawfully owned it…wait…would they have allowed that transaction to occur?